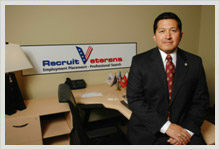 Launched in 2006, Recruit Veterans is an award winning, 100% veteran-owned and operated social enterprise that partners with our client’s to “Accomplish the Mission!” We provide managed services and workforce solutions that enable our clients to concentrate on and accelerate the success of their organizations. Whether we’re managing a service or providing a workforce solution, our entire company is singularly focused on identifying and winning opportunities to put veterans to work. To be the leader in identifying and capturing opportunities that will result in the hiring and placement of our nation’s military veterans and their family members. Our mission is to seek out, identify and win business opportunities in the public and private sector in order to put military veterans, spouses and dependents to work. Recruit Veterans believes in maintaining a strong value system to help guide our employees as they work with our clients, partners and fellow employees. 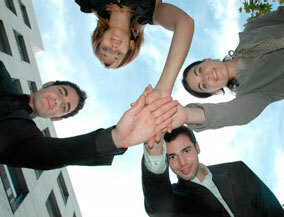 The values and traits listed below are ingrained in our company culture. A mindset and corresponding actions that reflect our commitment to listen to our customers’ needs, provide them with efficient and cost effective solutions, respond to their requests in a timely fashion and meet or exceed their expectations. A decision to wholeheartedly support our mission, our clients and each other. To be courteous, considerate and polite to our customers and each other. Being honest and fair to our customers and each other. The ability to carefully weigh facts and possible courses of action in order to make sound decisions. Having very strong support and loyalty to a person, group or cause. Appropriate and sensitive, never rude or careless. Introducing new ideas and methods to streamline operations. Taking action to initiate and complete tasks while making decisions without direct managerial influence. Displaying a positive, cheerful attitude and mindset especially during challenging situations. Having information, understanding and skills that come from experience or education, particularly within your profession. Producing desired results without wasting materials, time, energy or money. Acting with a sense of urgency to accomplish tasks,projects and making timely decisions. A sense of duty, devotion to our company, our mission, our customers and each other.